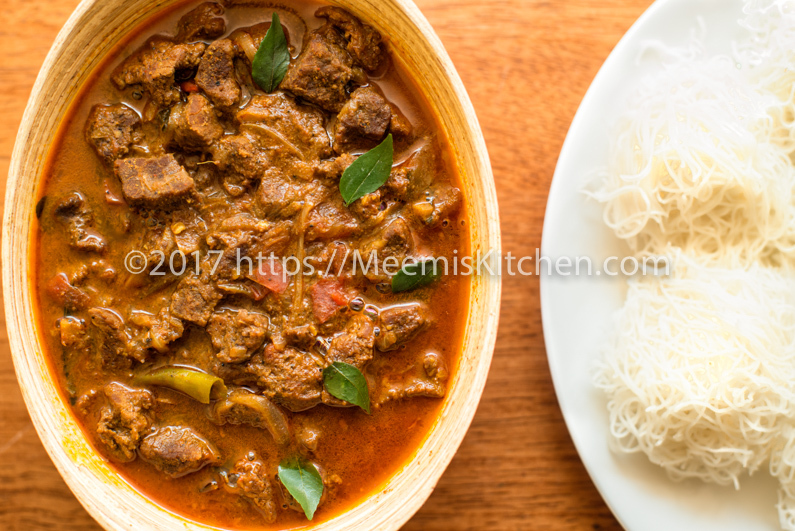 Nadan Beef Curry / Spicy Kerala Beef Curry is a popular dish in Kerala, a flavorful, Spicy Beef Curry which pairs well with rice, Appams or Rotis. A classic Sunday dish in many homes, Nadan Erachi curry is deliciously spicy and a much coveted dish in Toddy shops. The spiciness and the aroma of Masalas will get you hooked. In Thattukada or street food joints, this is in high demand with Parottas. Kerala Beef Curry is also popular in Toddy Shops across Kerala, known as Beef Shappu Curry, alongwith Liver fry, Chicken liver curry and fish fry. During our childhood, we had lovely family get – togethers almost every weekend; the kitchen would be the most happening place; with all hustle bustle, all the laughter, chit chat of my aunts, the cutlet making, the aromas emerging from the pressure cooker, and the elaborate spread. Beef Ularthiyathu/ Roast, Kerala Beef Fry, Beef curry, Pork Fry/ Pork Curry/ Pork with koorka was always there along with Aval Appam, Palappam, Beef Cutlets/ Chicken Cutlets/ Fish Cutlets, Fish curry, Prawns Masala or Chicken fry / chicken curry, Mezhukkupuratti and thoran, Moru curry, and crispies like Pavakka fry or Kovakkai fry. Sometimes there will be Kappa (Tapioca) or Chakka kuzhachathu (steamed unripe Jack fruit) or Kappa Biriyani. Tasty memories!! I am getting nostalgic again and how I wish everyone was together again like old times!! All said, it is not very advisable to consume red meat as it can increase your risk for heart diseases, diabetics etc. I have cut down on red meat and try to lessen the effects by serving Dal curry with chappathis and adding vegetables to Nadan Beef curry like Beef with Kaya, Meatball curry, Beef with Koorkka, Beef and Beetroot curry, Beef with Mushroom, Beef stew etc.. Once in a while indulging is fine, but don’t forget to shed the excess calories by exercising. Coming back to the recipe, Kerala Beef Curry is a very spicy dish like those served in Toddy shops (Shappu) or Thattukada. Enjoy with Vellayappam, Neer Dosa, Kallappam, Palappam, Idiyappam, Rice, Naan or Rotis. Beef (Buffalo Meat) : 1 kg. 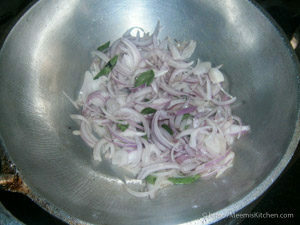 Small Onion : 6 – 8 nos. Wash and drain the beef pieces. 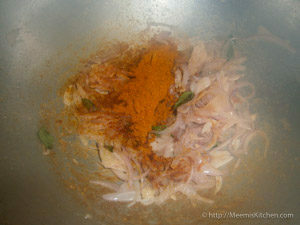 Marinate with chopped Small onions, garlic, Ginger, coriander powder, chili, Turmeric, Pepper, Garam Masala powder, vinegar, slit green chilies and salt. Keep it aside for half an hour. Pressure cook the beef till done. 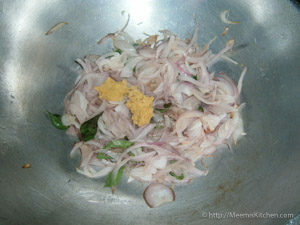 Heat oil in a Kadai, sauté the sliced onions and curry leaves. Once it is limp, add ginger garlic paste. Fry for some more time. 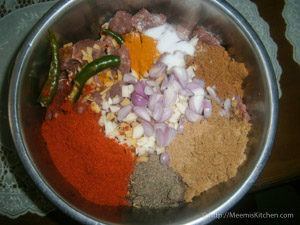 Mix and add chili, turmeric, Garam Masala, Perumjeerah powder. Roast and add chopped tomatoes. 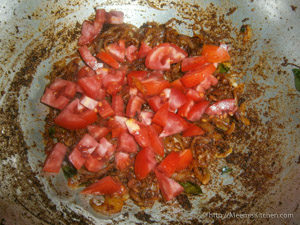 Once the tomatoes are mashed, add the cooked Beef with water. Combine and bring to a boil. Adjust the salt. Let it simmer for some time till the gravy attains correct thickness. 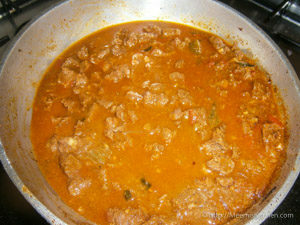 Your Kerala style Beef Curry is ready. Serve hot with Appam, Idiyappam, Rotis or rice. 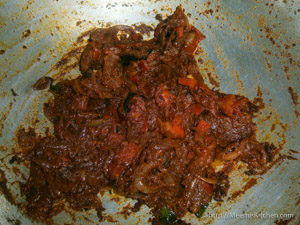 Authentic Kerala Beef Curry is usually spicy, however adjust the spice levels as per your liking. 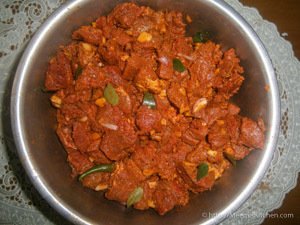 For Kerala style Beef Curry, Beef with little fat is recommended for best results. Beef should be marinated for half an hour and then pressure cooked for best results. Check how to make Garam Masala at home. Serve with Palappam, Idiyappam, Rotis, Rice or Whole Wheat Naan for a hearty meal. You may add Potatoes and coconut milk for less spicier version. If you like this Kerala style Beef Curry recipe, share with your friends using the share buttons on the side or put in your comments. I will be happy to see your comments. God Bless!! So simple to make…my family absolutely loved it….I finally received compliments from my husband after a long time. …thanks to you….